Practice progress for AFL Women Hear from AFLW assistant coach Harmit Singh as he reviews Collingwood's AFLW practice match at the Holden Centre on Friday night. 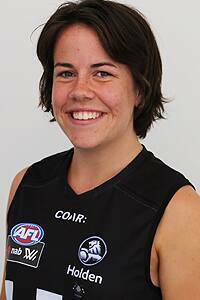 Georgia Walker couldn’t believe her luck when she received a phone call from Collingwood AFLW coach Wayne Siekman. Having been overlooked in October’s AFLW Draft, Walker thought her dream of playing in the inaugural NAB AFL Women’s Competition was over, but Siekman had different ideas. The Pies’ AFLW coach had watched Walker star against his side in a practice match and wasted little time offering her a place on Collingwood’s 2017 list as a replacement player for Kendra Heil. “It’s such a shock to be selected after the Friday night practice match. I’m absolutely honoured and I can’t wait to get started,” Walker said. Walker replaces Canadian recruit Heil who was ruled out of the inaugural competition following an ACL injury in November. The former Dandenong Stingrays and Vic Country Youth Girl’s captain will become the youngest player in the team having turned 18 earlier in December. Siekman said that the midfielder/defender used the disappointment of missing out on October’s draft as a key motivator to improve her game. “We were always impressed by Georgia’s ability and you can see how missing an opportunity earlier in the year has motivated her to keep improving on and off the field,” Siekman said. AFLW Football Operations Manager Meg Hutchins echoed Siekman’s comments on Walker. “Georgia is a natural leader and someone with a huge amount of work ethic and inner drive to get the most out of herself, which ticks all the boxes for the type of player we want to have in our AFLW team,” Hutchins told Collingwood Media.